Graham Watson is doing a column for ThePaceline.com, and in today's edition he speculates (and admits to speculating) that today's breakaway that upset the Dauphiné applecart smells like an Armstrong operation. It is fun and slightly mischievous to consider that in the big escape of the day, at least half of them are known to be chummy with Lance. Juan Antonio Flecha and Axel Merckx are two of his closest buddies, and add the fact that his own teamate Benjamin Noval was in the break as well, you can then hypothesize that Lance and his team had quite a hand in letting that escape get away – and then sat back and watched the others struggle to comprehend what was going on. Once the chase started – with Landaluze at least ten minutes ahead of the peloton, Lance and his teamates were able to watch as T-Mobile, then Phonak, then Gerolsteiner took it in turns to chase. I also wonder about Levi Leipheimer's early break: Apparently, he and two teammates managed to gap the field among more than 30 other riders just 25 kms into the race today, forcing T-Mobile to the head of the field to ride tempo and bring them back. There are a couple of pictures accompanying the article of Armstrong in an unusual jersey: the Dauphiné's "combined classification" jersey, whose color reminds me of Armstrong's first pro jersey, with Motorola. Axel Merckx spent most of the day alone, riding away from an early break that gave him the day and Euskaltel's Inigo Landaluze the overall race lead at the Dauphiné Libéré. The break made the most of a lazy pace by the main field, and most of its members finished 7 minutes plus on the peloton. Merckx moves into second overall. It's Merckx's first win since 2003; he took the bronze in the road race at the 2005 Athens Olympics. It kind of looks like Armstrong might have taken the presence of Noval up the road as a chance to make Gerolsteiner defend Leipheimer's jersey, and, for whatever reason, the G-men declined. We'll see when the stage photos go up. The peloton came in at 9:36, with all the previous GC leaders included. Levi Leipheimer fell late in the stage, but was only slightly injured. Credit Agricole's Thor Hushovd took a sprint finish Monday at the Dauphiné Libéré's first stage, ahead of Phonak's Robby Hunter, and Fassa Bortolo's Juan-Antonio Flecha. A six-man breakaway including Sylvain Chavanel and José Garcia-Acosta tried to deny the sprinters, but were caught about 4 kilometers (2.5 miles) from the line. No change in the overall, with George Hincapie maintaining the leader's jersey. "A victory on the Dauphine Libere is always good for morale but my main goal this season is to win the Tour de France points classification," said Hushovd, who cited Belgian Tom Boonen, German Erik Zabel and Australians Stuart O'Grady and Robbie McEwen as his main rivals for the green jersey. "Lance showed today he's pretty strong. He closed that 25-second gap practically on his own," said Hincapie, who will be back to his helper role in July. Jan Ullrich reports on his website (in German) that he will first race April 5th at Circuit de la Sarthe, then Vuelta Ciclista a Aragon April 13th and the Volta a Catalunya May 16th. Still up in the air is the Tour of Switzerland June 11th-19th: Ullrich is still considering racing instead at the Dauphiné Libéré June 5th-12th and the ProTour's team time trial at Eindhoven June 19th. Levi Leipheimer's diary at Bike.com has been updated with his take on the Dauphiné, and especially the ITT on Mont Ventoux ("One hour uphill in 100+ degree weather is torture"). He predicts Armstrong is right on track for a 6th consecutive win at the Tour de France, as he says Armstrong's form improved steadily through the Dauphiné. Leipheimer also offers his congratulations on the new Discovery Channel team: "American cycling will continue to have a home team." It's not so great to hear about the tabloid trash coming out accusing Lance of cheating. I really hope no one buys this book and supports this "speculation". This crap is only written to make money so don't buy into it. Our sport has already paid enough. The writer has admitted to having no proof to back his claims so why waste your time? Stuart O'Grady showed his conditioning for July with a second stage win at the Dauphiné Libéré. The win, plus his points in the intermediate sprints Sunday, gave O'Grady the race's green jersey. Interestingly, neither victory came in a field sprint, once O'Grady's specialty. 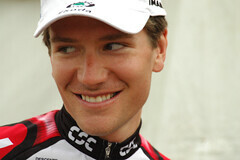 Sunday, he won in a long breakaway that was largely uncontested by the main group. Iban Mayo of Euskaltel-Euskadi took the overall on the strength of the individual time trial up Mont Ventoux on Thursday, where he won by 35 seconds over Tyler Hamilton, and 2 minutes over Lance Armstrong. Armstrong took a moral victory of sorts when he won the field sprint among riders who didn't make the breakaway, taking 7th place on the day. "It was an interesting week," Armstrong said. "I was not as super as I would have wished. It was a tough week too, with super riders like Mayo or Tyler Hamilton. "I still must improve. But I had no crash, no problem, overall that's good," he added. Hamilton's Phonak team took the team competition, after refocusing its sights based on Mayo's incredible time trial. O'Grady's stage win was the result of a breakaway that included O'Grady and his teammate David Millar, that let O'Grady collect the intermediate sprint points, and he wound up taking the stage, to boot. American Levi Leipheimer of Rabobank also tried to break away from the field late in the race, and spent quite a while being chased by the Euskaltels. "This week was great experience for the Tour," he said. "We had a very young team here and they got in a lot of hard work that should give them all more confidence next month. A classic stage-race move on Friday, as a number of strong riders low in the general classification pulled a winning breakaway clear of the peloton. Among the escape were US Postal's George Hincapie and Victor Hugo Peña, Cofidis sprint specialist Stuart O'Grady, Baden Cooke of fdjeux.com, Nicolas Jalabert of Phonak, Brioches La Boulangere's Jerome Pineau, Yuriy Ktivtsov of AG2R and Pierrick Fedrigo of Credit Agricole. With so many teams represented, Euskaltel-Euskadi didn't get much help chasing the break. With around 50 kilometers to ride, Hincapie and O'Grady pushed the pace, and quickly gained a minute on the breakaway group. O'Grady, who has come close a few times this season, outsprinted Hincapie for his biggest win of the year. Procycling.com | Dauphiné 4: Mayo beats Tyler by 35 secs, Lance by 2 mins! This result will certainly lead to a huge amount of speculation about Armstrong’s prospects of taking a sixth Tour title, as well as some considerable bigging up of Mayo. But the Tour is still a month away, and Mayo still has to negotiate two very tough days in the Alps during this race yet. And once again this year the question has to be asked about whether Mayo has reached his peak too soon. If he comes away victorious from the Dauphiné and claiming he still has more to give, then he really will be shaping up as a serious contender for the Tour title. On Armstrong, they say he "surely won’t be happy at seeing some of the most likely challengers for his Tour crown receive such a huge confidence boost." VeloNews has a detailed look at today's time trial, and breaks it down by time station, so you can easily see who was fastest on each segment of the mammoth mountain. What worked in Mayo's favor though was that he started four minutes behind Armstrong and two behind Hamilton. After the relatively easy opening stretch of 5.7km at 4.2 percent, Armstrong set a then-best time of 10:13. Hamilton came through in 10:20, while the supposed-to-be-going-slow Mayo sped though in 10:04. "I didn't expect to do the fastest time in that first phase," said Mayo. "I was riding within myself and just getting a feel for the bike." For the first time, he was using a brand-new climbing bike from Orbea, the lightest that Mayo has ever ridden. It's no surprise that Iban Mayo is in incredible shape for the Dauphiné Libéré: He won Sunday's prologue time trial to wear the race's yellow jersey. A little more surprising is that he was able to put almost 2 minutes (!) into Lance Armstrong in today's time trial up Mont Ventoux, as Mayo set a record for the climb at 55:51. Mayo showed he's got to be among the favorites in July's Tour de France, and looks like the favorite to take the Dauphiné when it closes out on Sunday. Tyler Hamilton had an awesome ride to finish second on the day, 35 seconds back of Mayo, and moves into 2nd overall, 36 seconds behind the Euskaltel-Euskadi rider. Hamilton's Phonak teammate, Oscar Sevilla, was 3rd on the day, and 3rd in the GC. Armstrong, 5th on the day, remains 4th overall, at 2:00. Levi Leipheimer of Rabobank was a respectable 8th overall, but was caught by Sevilla on the course. "I thought Armstrong would be faster; I think it's a big surprise and maybe he had a bad day," said the happy Basque rider who now has command of the Dauphiné. "I'm a little disappointed; not in Lance, but in the differences between him and Mayo. It shows [we] are still not ready for the Tour. Lance did what he could today. Mayo beat the record by almost a minute which is an incredible performance." "It's clear that Mayo is in top form now; he's very strong. For me today, my time wasn't as important as how I felt and I felt good...the sensations were positive. I came here to make two tests, the prologue and the TT and I was second in both of them." As for his former teammate and Gerona neighbour Lance Armstrong, Hamilton said "He's still the favourite for the Tour De France." Cyclingnews.com has a good profile of Mont Ventoux, the role it will play in the Dauphiné Libéré and the role it has played in the Tour de France. The mountain itself is remarkable, as barren as the moon, and makes a dramatic setting for a bicycle race. Ventoux is where Tom Simpson died in 1967, where the Armstrong-Pantani minifeud began (did he let Marco win, or was it a sign of disrespect?) in 2000. In 2002, Armstrong set the unofficial record up the mountain, 50 minutes chasing (but not catching) Richard Virenque. Tyler Hamilton won a road stage of the Dauphiné Libéré here in 2000.
Who will conquer Ventoux this year? At the pre-race press conference, Lance Armstrong said, "with the uphill time trial on le Mont Ventoux, it will be a great test for me before the Tour de France." Armstrong desperately wanted to win on Ventoux in 2002, and needs to measure his progress toward his attempt on a sixth Tour de France victory in July. For Armstrong, that victory will almost certainly have to include another mountain time trial, up Alpe d'Huez in the Tour's stage 16. Who could resist a crack at a double that will probably never to be repeated, time trials up Ventoux and l'Alpe in the same year? The peloton was fairly quiet on Wednesday, in preparation for Thursday's major battle on the face of Mont Ventoux. Nicolas Portal of AG2R was the best of an early breakaway. Also surviving the breakaway were Estonian Janek Tombak of Cofidis, who was second on the day, and Iker Flores of Euskaltel-Euskadi, who was third, both 51 seconds behind Portal. A group of the peloton's strongest riders came in 1:49 back, including Lance Armstrong, Iban Mayo, Tyler Hamilton, Floyd Landis, and current race leader José Gutierrez, who continues to lead Mayo by 8 seconds, Hamilton by 9, and Armstrong and two of Hamilton's Phonak teammates by 10 seconds. Mickael Pichon took a serious fall into a ravine on the last descent of the day. He suffered "serious head injuries, with injuries to the left side of the face." Thursday is a 13.4-mile time trial climbing up Mont Ventoux, and will likely shake up the GC. Armstrong would like a strong showing in advance of the climbing time trial on L'Alpe d'Huez during this year's Tour de France. Cyclingnews.com has a quick intro of the new Giro Rev Six time trial helmet, that premiered in Sunday's prologue at the Dauphiné Libéré, worn by Lance Armstrong, Tyler Hamilton, and Viatcheslav Ekimov. It's the response from Giro to new regulations requiring time-trial helmets to meet the same crash-protection standards as everyday helmets. Giro claims the helmet meets safety standards while having even less drag than the Rev Five helmet Armstrong wore last year, which was essentially a plastic shell with little protection built in. Giro's rep suggests the new helmet is heavier and larger than the Rev Five, but of course drag is the main factor in the TT equation. Jimmy Casper of Cofidis went on a stage-long breakaway, where he led the pack by as much as 18 minutes, but was reeled in 2 kms from the stage finish. In the end, Thor Hushovd of Credit Agricole took the sprint ahead of Stuart O'Grady of Cofidis, for Hushovd's 7th win of the season. Overall standings were essentially unchanged, although David Millar of Cofidis lost 58 seconds on the stage. Credit Agricole's Hushovd said: "This win makes me believe I can compete for the sprinter's green jersey in the Tour de France." He added: "I know Alessandro Petacchi is the best sprinter in the world, but I'm better in the hills than he is."